When it comes to finding the ideal bed for your kid, it is certainly not an easy affair with the array of options available. There are different shapes to choose from, different sizes to take in to consideration, metal or wooden frameworks and the space available. While some would rather go for traditional bed layout for their kids, twin loft beds are the ideal option for parents or guardians looking for organization or have limited space. Although there are many twin loft beds to choose from, rest easy because we have compiled a list of the best twin loft beds for kids in 2018. 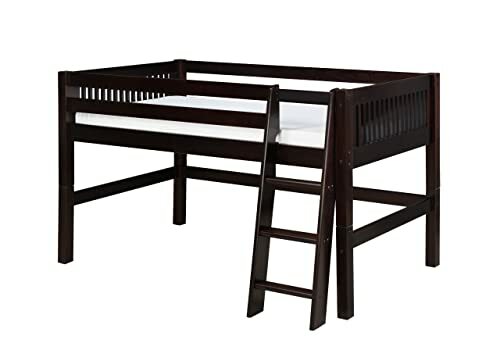 If you are looking for a strong and sturdy kids loft bed, then the Donco Kids low study loft bed is worth your interest. Its pinewood frame not only gives you the assurance that it will keep your kids safe but also a sense of durability. Its drawers, shelves and pull-out table on the other hand are made of MDF to make the drawers light and easy for the kids to pull. Design wise, it comes in two variations. The first option has drawers, side shelves and a reading pull-out desk. The shelves can be used to organize different reading materials for your kids while the drawers can host your kids clothes. One thing to note is that the drawers and shelves are removable. The second option comes with a tent minus the shelves, drawers and desk. This can be used as a playing section for your kid. The option you choose will depend on your budget. The Camaflaxi mission style twin loft bed might look like your average twin loft bed, but remember, looks can be deceiving. Giving it a firm shake, you will notice that it is strong and sturdy despite its weak like appearance. This is due to its all pinewood frame and compact design. There are three colors to choose from; cappuccino, natural and white. 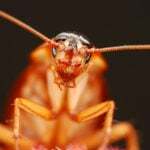 Choice of color will vary with your room decor. Another interesting thing about this bed is that you can choose whether the angled ladder is at the side or end of the twin loft bed. The steps are deeply grooved to enhance safety. Its name says it all. 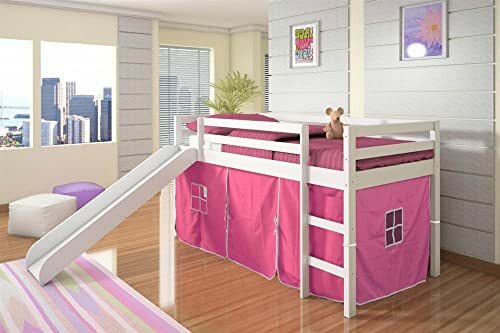 The Twin tent loft bed not only comes with an inbuilt ladder, but also a slide that can make it fun for kids when launching out of bed in the morning. For safety reasons, the slide has side panels to protect your kid from sliding on the side. When choosing the right twin loft bed for your kid, safety is paramount. 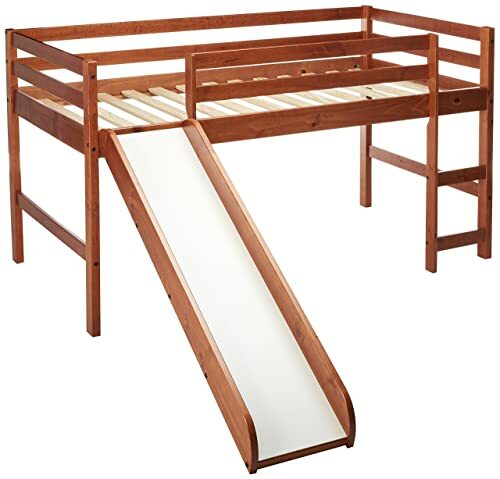 This twin loft bed features a strong and sturdy frame made from pine. To add another pinch of durability, the bed’s surface has a durable wax layer which protects it from wear. A tent is also included with a range of colors to choose from. This is yet another eye stunner. This loft breaks away from the traditional like loft beds we have been used to and goes for a more modern design approach. Its employs a modular approach, meaning one bed can be designed in a manner of ways just by interchanging the modules. The modules in this case refers to the drawers, shelves and the ladder. 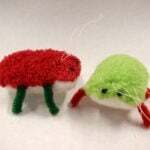 Setting it up can be a fun project with your kids. Sometimes the simplest design is the best design and this might be the mantra Donco is going by given its simplistic design. Made from Brazilian wood and sweat, the 750TE, although not the best looker around, promises functionality and fun for kids. With a ladder on one side and slide on the other end, kids can go to sleep and wake up launching themselves down the slide. 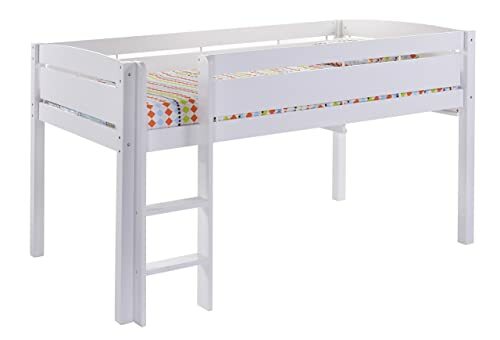 With a ground clearance of 29 inches, it is possible to fit a toddlers bed beneath the 750TE series loft bed or the kids can use it as a playing area. Donco has a huge reputation for making high quality products for youth and kids alike and the twin mission 715-tcp is no different. It comes in an attractive dark cappuccino color which matches easily with most room decors. In terms of safety, the bed is made of strong pine and being a low loft bed, it is safe for a child to sleep in or play underneath. Kids will also find this bed to be fun. Simply slide down when they wake up in the morning using the provided slide which can be fitted on either side of the bed. 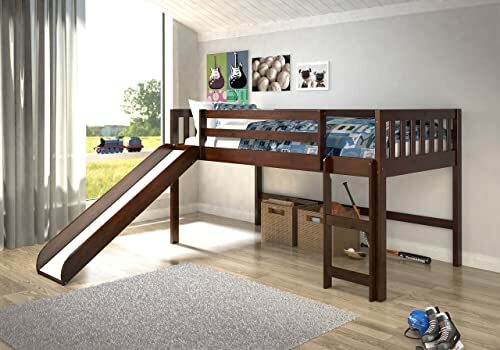 Unlike most of the twin loft beds on the list, the Canwoood Whistler junior loft bed sports a full length guard rails for maximum protection of your kids. Structure wise, majority of its frame is made of pine coupled with a mixture of various composites for that sturdy feel. To enhance sturdiness, the bed is fitted with metal to metal fastening systems. Price is always a factor when thinking of buying anything. 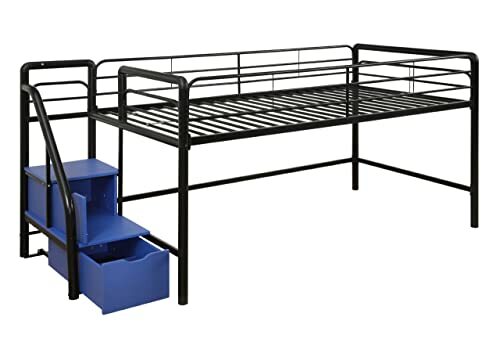 Standing as one of the cheapest loft beds on the list, it is suitable for individuals who are looking to save money or are on a tight budget. 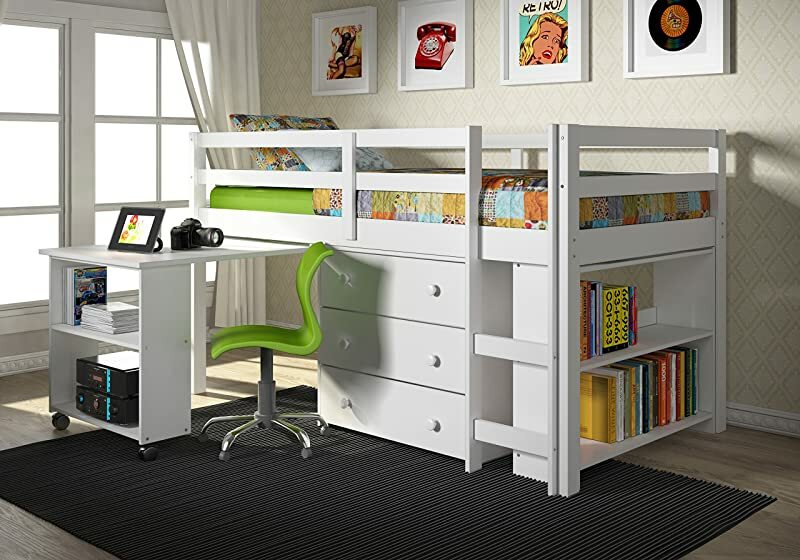 This is the first metallic twin loft bed for kids. Weighing at only 58.5 lbs, it is unbelievable that it can hold up to 200 lbs. It is strong and firm, capable of supporting three or more mid sized kids while they play. Another safety feature of the DHP junior bed is the bed’s rounded edges. 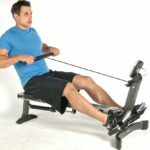 It can help prevent numerous injuries. In terms of price, it is very affordable just under $150! Creativity is one thing. Functionality is another. Mixing the two and the result is a masterpiece. The DHP junior bed with storage steps loft bed shows just how you can kill two birds with one stone; storage unit acting as a stair case. In terms of its build, this loft bed is made of a sturdy metal frame coupled with a sturdy metallic stair case frame. Its sides have running guard rails to add more protection to your kid. Metal and durability are synonymous. 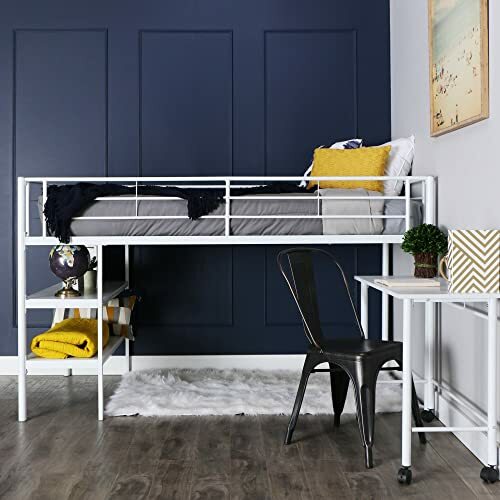 The twin loft metal bed from We furniture is worth considering if you are looking for safety, functionality and durability in one package. 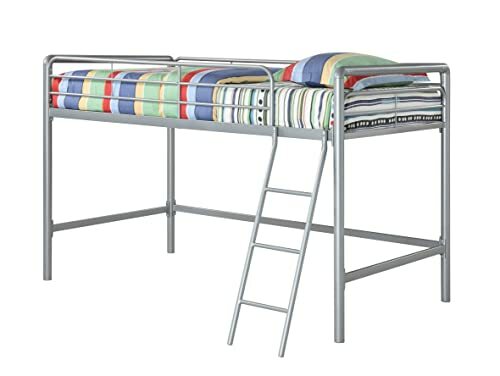 Its entire frame is made of metal meaning it is one of the sturdiest loft beds available. Its frame also includes an integrated ladder and MDF shelves. Also included is a side, detached desk. It’s powder coated to give it an attractive look. Arguably, twin loft beds are a great accessory for parents looking to create space for their kids and keep them organized. However, choosing the right loft bed can be hectic. 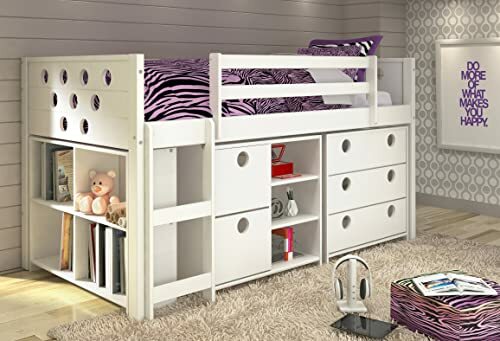 Thankfully, we have compiled a great list of 10 of the best twin loft beds for kids in 2018 to help you chose what is right for your kid.